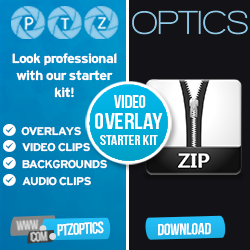 PTZOptics Live Video BlogFree guide to Corporate Live Streaming: Download Now! At PTZOptics, Corporate Live Streaming for Corporate Communications is all about connecting organizations to the people that matter most all around the world. Corporations like the American Bible Society, shown in the video integrate camera controls into larger audio visual systems such as Crestron touch panel to create turn-key video production systems that can be operated by in-house staff at a moment’s notice. PTZOptics cameras are an integral technology used for corporate events, shareholder meetings and company-wide keynote presentations alike. In today’s mobile world, delivering video directly to desktops, tablets and smartphone devices has never been easier. Live Streaming for both internal and external communications is now standard practice for companies small and large. With professional mounting options, PTZOptics cameras can be discreetly mounted on the ceiling, wall or even pole mounted to capture the ideal presentation angle for your space. Whether your company is broadcasting a private meeting or broadcasting a new product release on Facebook, looking professional will be a key component to your video communications success. Here you can see the American Bible Societies Collaboration Room, where the in-room attendee presentations experience is enhanced with image magnification on multiple displays. The camera operators can easily zoom into a lectern or following a roaming presenter with remote pan, tilt, zoom control of their selected camera. Each camera features preset PTZ position options to zoom into a known location for easy operation. The Crestron Touch Panel shown here easily integrates with the PTZOptics pre-built modules allowing employees control over everything from window shades to projector input switching. PTZOptics cameras are made with high quality optical lenses to optimize the video in most lighting scenarios. Combine the high quality optics with best in class pan, tilt and zoom motors… Here is where the true value of ptzoptics comes into play. With only a few cameras, your video team will have multiple options to produce high quality content for your corporate video communications. The ultimate guide to live streaming corporate events includes an in-depth look at the exciting live streaming industry. Chock-full of information for beginners and advanced streamers alike this guide include tips from the following industry experts: VERSION 1.0!